These soft, textured cloths work gently without drying skin. They're dermatologist tested, hypoallergenic, and safe for contact lens wearers. With an even blend of fibers and polyester, they gently remove makeup and impurities to instantly revive dull skin and leave it soft. Now with a rigid lens closure, towelette dry-out is minimized. Keep a pack at home and one in your purse for on-the-go convenience! Soft white Kaolin clay: a mineral known to act like a magnet to gently draw out deep-dwelling impurities. Luminous Clean™ MoistureClean™ Towelettes is rated 4.5 out of 5 by 8. Rated 5 out of 5 by MaineGirl from Best Towelettes Ever! These are my favorite towelettes. I've tried many products and these are the first that I have found that are gentle, have a light scent and clean well. The textured cloth combined with the clay create a deep clean that you cannot get without a face scrub. I travel often and there are times when the water is too hard or too dirty (dangerous) to use on my face and will often cause breakouts. I pack these whenever I travel and use these instead of water and face wash. Rated 5 out of 5 by Ashwick from Amazing I'm going to be one of those annoying people who say that I've never ever written an online review before. I know I know, *sure you haven't..* but I'm serious. I cannot rant and rave over this product, enough. I love them so much that they've got me sitting here writing this review. I have EXTREMELY bad allergies and suffer from chronic sinusitis. Unfortunately, dark/puffy/zombie apocalypse looking eyes comes with such chronic issue. I never would have guessed in a billion years that a face wipe would help take care of my dark under eyes. I noticed a difference immediately, not only in just my eyes, but my whole face as well. My skin looked bright and refreshed and felt very soft. I could go on and on about this product, but overall I highly recommend these face wipes to anyone. I'm 99.9% positive that you will not be disappointed. The only complaint I have is that I've been having a hard time trying to find these recently. They haven't been in any of my local stores for quite sometime now and it scares me because I really hope they are not being discontinued. :( **I ended up getting the whole Luminous line..as you can see in the added photos. Obsessed much?? 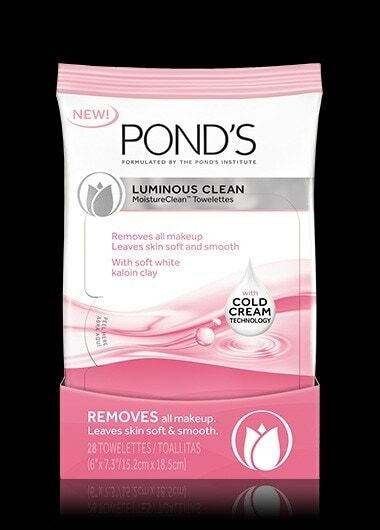 Rated 5 out of 5 by Tiff7 from I'm a convert to Ponds I just discovered this product in November of '13 and I am officially a convert to Ponds products. My mother always used your cold cream, but I noticed this in an advertisement and although I was going to buy the cleansing wash, I grabbed the clothes and I am a total convert to them. LOVE them. People tell me that my skin is gorgeous and I tell them about this product. Rated 5 out of 5 by Napa Sharon from Love the feeling I got these as a free sample with the Evening Soothe Towelettes.They left my skin looking bright and clean. Very nice. Love that it's quilted because it seems to clean all the make-up and daily grime off without being abrasive. Rated 1 out of 5 by TRICIA from Why did you change this wonderful product's cloth? I absolutely LOVED this Luminous Clean Wet Cleansing Towelette and used it for several years. Now the Luminous Clean product is being produced with a different, untextured cloth just like other products out there that I don't like. The previous cloth was textured and soft, this new cloth is not textured and is rough. Why would Ponds change a perfect product, unless it was to lower production costs?!?! So disappointed. Rated 5 out of 5 by Kara2267 from Removes everything gently Love these towelettes, the luminous clean towelettes are the only ones I use as it removes everything I need it to. The other towelettes break me out I think because they are a little too soft and don’t remove as much dirt or makeup as the luminous clean towelettes. These have a little more exfoliation power that the other towelettes do not have, and it doesn’t leave a sticky residual on my face like the other types of towelettes do. Rated 5 out of 5 by Suzie14 from AMAZING I absolutely love these! I bought them by chance and now I use them everyday. I recommend them to all my friends.